King Arthur's Last Resting Place? The Tradition: Early stories tell us that Arthur was taken to the Isle of Avalon to be healed of his wounds after the Battle of Camlann. Late tradition assumes that he died and was buried there, though earlier sources indicate the whereabouts of his grave to be unknown. Hence his lying under a mysterious hill waiting to return and lead his people to victory. 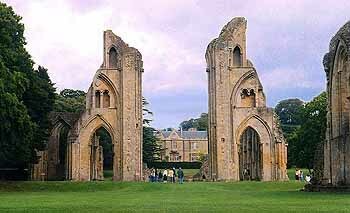 Avalon is traditionally identified as Glastonbury and Arthur is thus assumed to have been buried at the ancient Abbey there. This was an eminently suitable spot for the last resting-place of the High-King: the most holy place in Britain, for Glastonbury's Vetusta Ecclesia or "Old Church" is said to have been founded by St. Joseph of Arimathea himself. Ancient Discoveries & Propaganda: Unfortunately, the identification of Glastonbury with Avalon immediately follows the miraculous events of 1190. In this year, the monks of Glastonbury claimed to have discovered the bodies of both King Arthur and Queen Guinevere between two "pyramids" in their ancient cemetery near the Lady Chapel. They were excavating the area on information passed to King Henry II by "an ancient Welsh bard", after a disastrous fire made the discovery of pilgrim-attracting relics a top priority. The Norman Kings, moreover, were concerned about the prospect of a Welsh rebellion, and were eager to prove that King Arthur was certainly dead and would not return to lead it. As proof of the bodies' identification, the monks produced a convenient leaden cross found above the grave, recording (according to Giraldus Cambrensis) "Here lies buried the renowned King Arthur with Guinevere his second wife, in the Isle of Avalon". Modern Archaeology: Any trace of the wooden Vetusta Ecclesia or "Old Church" has been completely destroyed by the crypt of the Lady Chapel, but Radford's excavations did find the post holes of four early buildings in the ancient cemetery area to the south. He also revealed extensive details of King Ine's Abbey Church built to the east in 720, extensions of the 760s and St. Dunstan's partial rebuilding in 1000, as well as the medieval Abbey. At the indicated original site of Arthur's grave, excavation revealed two mausolea. Between these was a "large irregular hole" dated to the 1180s from its infilling with waste from the building of the Lady Chapel. Possible Interpretations: Though there is no dating evidence for the Vetusta Ecclesia, it probably existed in the early Dark Ages. An Abbey of some sort is indicated at this period by an extant land grant from an early King of Dumnonia (possibly Bledric) dated to 601. Radford believed his early postholes were the remains of the cells of Dark Age monks, though this is hotly disputed. The two mausolea near the site of Arthur's supposed burial were probably the graves of revered saints or founders, marked by tapering stone crosses, the so-called pyramids of early writings. Adjoining burials would have been reserved for highly important persons, if not Kings. The large hole was, presumably, all that remained of the monks' earlier excavations. Arthur's memorial cross disappeared in the 18th century, but a 1607 engraving by Camden survives. Unfortunately this does not show any mention of Guinevere, though this could have been engraved on the reverse. Alcock identifies the lettering to be of tenth century style and suggests the cross was placed in the grave at this date when St. Dunstan had the ground level of the cemetery raised and any standing memorials removed. Similarly dated leaden crosses have been discovered associated with burials excavated at nearby Wells Cathedral.